Target and train your chest, shoulders, arms and core with compound body weight exercises right in the comfort of your own house with the Portable Dip Station Bars with Push Up Straps from Soozier! ItÆs great for building lean muscles, burning fat, and is often used for doing dips, rows, body pulls and much more. 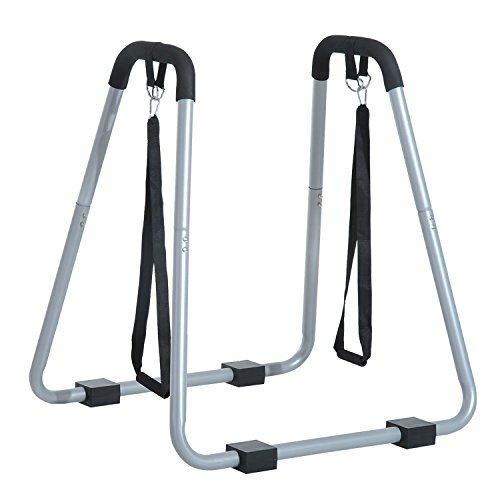 The equipped suspension straps also provide even more exercise options. With this versatile workout station, you will surely build strength and endurance while taking your fitness to the next level and beyond! ✔ FULL BODY: Work both your upper and bottom body with tricep dips, armpit dips, leg swings and more using the included push-up straps. ✔ DURABLE: The heavy-duty steel frame and tough powder-coated finish are built to last through repeated use and the toughest workouts. ✔ COMFORTABLE: Ergonomic foam handles and floor pads prevent slipping and avoid scratching the floor while you use it. ✔ SAFE DESIGN: The one-piece design with a 265 pound weight capacity and extra-wide base makes it stable and difficult to accidentally tip over. ✔ CONVENIENT: The light and portable build is easy to move from place to place and even easier to assemble making for one great dip station.